Workplace Insanity: Keep Your Eyes on THE GOAL! I have read a lot of business books over the years, some good, some not so good. Some stick with you, some fade away to distant memories. I also happen to enjoy reading novels, primarily mystery or spy novels. I think that is why one business book in particular stands out and remains my favorite. It has a great message and teaches great lessons; however, beyond that, it is written in the form of a novel, with mysteries to be solved, and leads the reader along in an interesting story to solve the mysteries. I think it’s great. 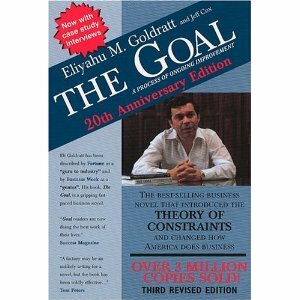 This book is “THE GOAL: A Process of Ongoing Improvement”, by Elihyahu M. Goldratt and Jeff Cox. While the book tells its tale from the perspective of a manufacturing organization, the lessons it teaches apply equally well to product development, and, in fact, to most organizations within any company. It’s a quick read, and I strongly encourage people to read it. The main thrust of the book is that all efforts in a company should be in support of THE GOAL. To make money, a company needs to increase its net profit, while increasing its return on investment, and increasing its cash flow. While this is true, it is not obvious to people in the trenches how they can help make this happen. In the case of manufacturing, which is detailed in this book, this is achieved by increasing throughput (defined as the rate the system generates money through sales), while reducing inventory (which is defined as all of the money invested in things intended to be sold), while reducing operational expenses (which are defined as all the money spent to turn inventory into throughput). The key is identifying the bottlenecks that reduce the flow through the system. These bottlenecks determine the overall system flow. The costs per hour for a bottleneck are the hourly costs of the entire system, not the costs of the individual pieces flowing through that bottleneck. What is required is to balance the bottleneck flow with market demand. While this sounds complicated, it really isn’t, and the book does a terrific job of taking you through it. Goldratt is the creator of the Theory of Constraints, which he describes here very well. Achieving THE GOAL in product development means delivering products on or ahead of schedule, while maintaining or improving product quality, while keeping product and development costs within or below budget (see Ineffective Engineering Costs You Time, Money, and Customers!, Late Projects Kill Companies, Poor Quality Products Imply a Poor Quality Company, and Too Many Cooks Spoil the Broth). Key to this is identification of and taking action on the bottlenecks that reduce the flow through the product development process. As with the manufacturing examples of the book, bottlenecks determine the overall system flow, and what you want to do is to improve the overall system throughput. Improving the flow through the bottlenecks can significantly increase the flow through the overall product development process. However, improving the flow through non-bottlenecks will do nothing to increase the flow through the overall product development process. A system of local optimums is not an optimum system at all; it’s a very inefficient system. The first step, therefore, is to identify the bottlenecks. These are generally not hard to find. Identify places where work is piling up; this is generally a bottleneck. Or, identify places where work can’t proceed because of missing pieces; the sources providing those missing pieces are generally bottlenecks. Do some investigation to verify that these are real bottlenecks and not showing up because of other real bottlenecks. Then, see what can be done to attack the bottlenecks. You may want to take resources from a non-bottleneck and apply them to a bottleneck (see Do Jobs Right; Assign the Right People!). You may want to modify the product development process flow to reduce or eliminate the bottleneck (see Move the Rocks and People Travel Faster). You may want to find tools that specifically address and improve the bottleneck flow (see Use the Right Tools to Do the Job Right). Think through other ways as well. Keep in mind, however, that when you reduce or eliminate a bottleneck one place, another will likely take its place. It is an ongoing process to identify new bottlenecks as the process evolves (see Bottlenecks: Concentrate on Fixing What's Critical!). Just remember that everything you can do to increase the flow through the bottlenecks will increase the flow through the entire process. And doing that, while improving quality, and reducing costs, will result in achieving THE GOAL.